Bono and The Edge, U2, played for homeless people in Dublin on Christmas Eve last Monday (24). The musicians participated in an event of the Simon Community organization, which supports the country’s street population. This event started in 2009, and U2’s last time there had been in 2015. 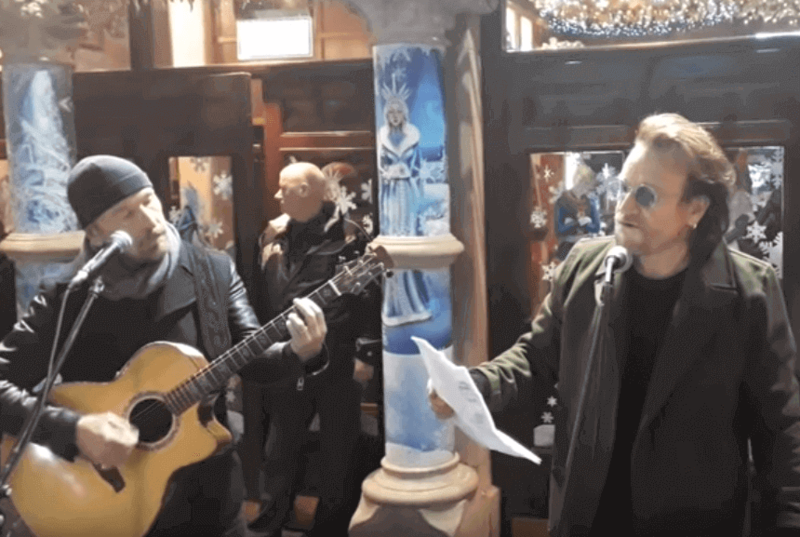 Edge and Bono played “Love Is Bigger Than Anything In Its Way” from the album Songs Of Experience, and featured the classic Christmas songs “O Holy Night”, “O Night Divine” and “Christmas (Baby Please Come Home) “, featuring Glen Hansard, Damien Rice, Imelda May and more. U2’s dubbed “Experience + Innocence,” gathered $126.2 million with over $4 million average gross per show. U2 is still has the most profitable tour ever with “360” with $735 million. Other tours that generated over $500 million are Rolling Stones’ “A Bigger Band” with $558 million, Ed Sheeran’s “Divide” with $555 million, and Coldplay’s “A Head Full of Dreams” with $523 million. According to Pollstar, Guns N’ Roses last tour “Not in This Lifetime” is now believed that is the second most profitable ever, having generated $562 million. Only in 2018, the band made $82 million with an average of $3.7 million per concert.